I saw a closer look on Sports Tonight and they have piggy-backed of Ferrari with the cover over the rim. The launch of the Williams FW30 is going to be delayed for a week. They will still test at Jerez, only that it will be the FW29, with the new gearbox that Toyota will also use. BMW Sauber is released, next up my favourite of them all, Red Bull. BMW looks nice and neat with a minor livery change to the wing to the drivers seat I can see. Apart from that and the new T Mobile sponsorship and the bridge there are no changes I think. Thanks Rhys Goldfinch, you are a legend!!! Please improve BATracer's profile if you aren't a member! What is your favorite team/driver? 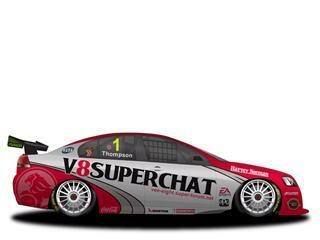 : Tasman is my team, JR is my driver. They are all adopting Ferrari's idea of having the cover over the rim. Finally the RB4 is out!!! The RB4 doesn't look different, but there are probably changes that you have to go right up to it to see. The blue paint looks brighter and they've changed the rims. Ford/Holden/Neutral? : Ze mighty Blue Oval! Ja! I love the RB4. Webber said in a Fox Sports Interview that he hated the "no traction control" policy that the FIA have adopted for 2008. I don't like the idea either, which makes the starts and the torque out of corners a lot more critical. It's sort of like the banning of bleed-off valves in 1998 which keeps the tyres warm during safety car periods. As well as that the Webber and Coulthard suits look so uber-cool with the retro style number up the top right hand side. Admin_Holden wrote: I love the RB4. Webber said in a Fox Sports Interview that he hated the "no traction control" policy that the FIA have adopted for 2008. I don't like the idea either, which makes the starts and the torque out of corners a lot more critical. It's sort of like the banning of bleed-off valves in 1998 which keeps the tyres warm during safety car periods. Once again, I like it! More driver, less car! Lets just hope that the RB4 is competitive our Aussie does well and makes sure he doesn't get rammed by another bull! Super Aguri are just gonna have an updated version of Honda's 2007 chassis. Williams and Renault chassis' have been launched today. Unfortunately, they were unable to have a maiden run due to poor visibility. They look similar to their previous models, but the Williams will probably launch a final livery later on. Thanks for the info Dave. Actually I read too quick. They ARE different. My bad. Now I'll go back on topic. I LOOOOOVE the Williams car, but I don't see any differences with the Renault car, apart from the bridge. Uhh... more McLaren designs?!!?!?!!??!?!? !